Partecipation in the testimony meeting held last Saturday 22 September at the Sala della Gran Guardia in the town of Rovigo was wide and interested. The meeting coordinated by Barbara Osti, who has already volunteered for ATS in Jerusalem, included special guests father Feras Hejazin, the parish priest of Jerusalem, and two young girls from his community, Lara and Margo. The girls recounted their experiences as young Christians studying and working in Jerusalem, their life and the reality of young people in a country as complex as the one in which they live. 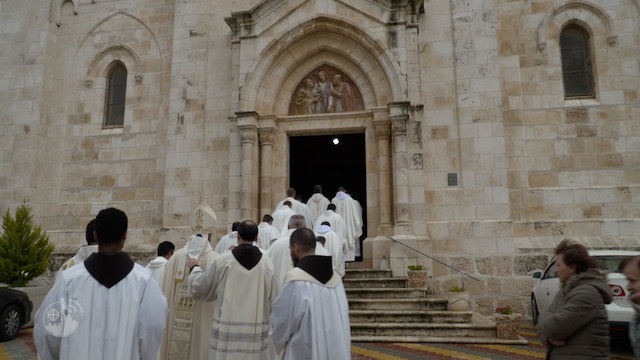 Father Feras talked about the Franciscan monks of the Custody of the Holy Land, recounting his experiences as the priest of the Latin parish of Jerusalem. 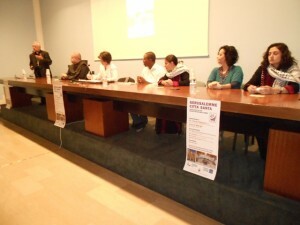 Among the initiatives undertaken by the Franciscans, he spoke in particular about the project “Jerusalem, Stones of Memory”, supported by ATS pro Terra Sancta, for the benefit of Christians who live in the Old City, as well as about the importance of visiting the Holy Land in a different and more profound way by participating in a kind of solidarity tourism.